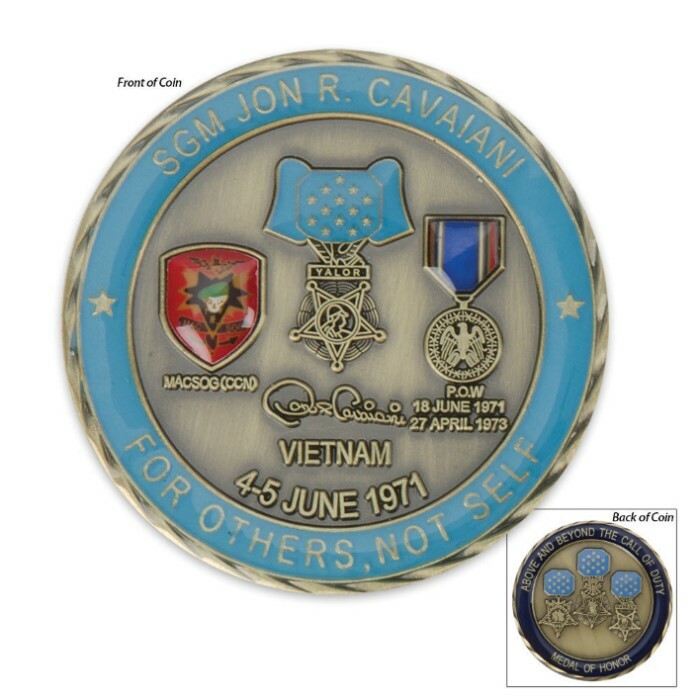 This set is in tribute to Jon R. Cavaiani, a recipient of the United States military's highest decoration, the Medal of Honor, for his actions in the Vietnam War. Established in December 1977, the Special Operations Association (S.O.A.) is composed of U.S. Army Special Forces personnel and also includes USAF Air Commandos / FACs, Navy Seals, Marine Raider and Force Recon personnel and veterans of other elite military organizations who were an integral part of Special Operations in the United States Military. 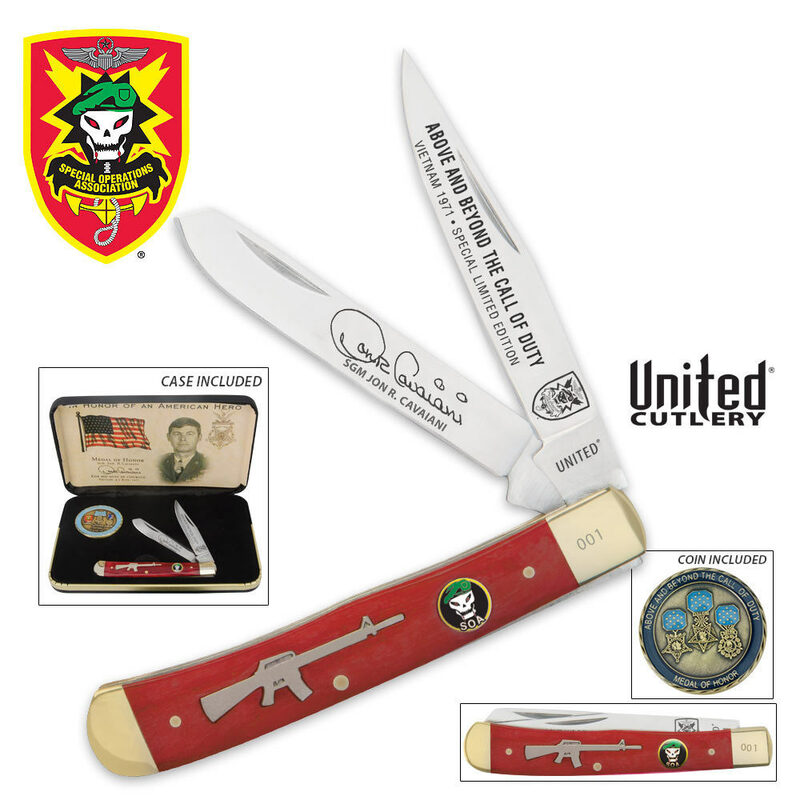 This commemorative set includes a trapper knife, an S.O.A. coin, and collector's gift box. This special edition knife has been honed to a fine edge sharpness. Each knife is crafted with high attention to detail and features polished jade bone handles with a gun shield. The main blade is AUS-8 stainless steel which has been etched with the words, "Above and beyond the call of duty." Each set comes packaged in a felt lined case with the S.O.A. emblem on the outside. Knife measures 4 in. closed and coin measures 1 1/2 in. diameter. The knife is advertised that it is serialized on the bolster. When I opened the box no number. I called and was told by Justin that you only get a C.O.A. The picture shows it being numbered on the bolster. Very disappointed. I ordered it because it was to be serialized. I was told I could return it but why pay shipping on false advertising. No more orders from me or my family and friends. THANKS FOR THE LOUSY CUSTOMER SERVICE.. I concur with both Fred and Dale's comments about the MAN and the knife set! It was an honor for me to fly CCN missions during 1970 and 1971 in support of MACV/SOG. Jon is a model of the courage and dedication that these men exhibited on every mission that I took part in! The ultimate professional and Brotherhood, the men of MACV/SOG! As a side note like so many of the gallant men who served with MACV/SOG, they battle many health issues and Jon is no exception. I have purchase over ten of these sets to honor Jon and this fine group of American Patriots! And yes, the quality of this product is worth every bit of the original price! I encourage you to buy a piece of history and honor those who give us our FREEDOM! This set is a beautiful gift for young people, veterans or history buff. GOD speed with your recovery, Jon! For the price of $12.98 this is an excellent deal. The knife is very sharp, engraving is excellent, leather covered metal case and raised surface challenge coin. The coin alone retails everywhere for $12.99. Nice for display open or to carry if so desired. I was not dissapointed. It was also nice to hit a special on shipping. Staff Sargent Cavaiani won the Medal Of Honor for his bravery on June 4-5, 1971 at Khe Sanh, South Vietnam. At that time I was stationed at Phu Bai with the 101st Airborne Division. He was later captured and spent 2 years as a POW. This man is a true American hero! Take it from someone who was over there and dealt with these guys on a daily basis! I have been collecting knives since I was a boy and have many very beautiful limited edition knives but this knife has just became my all time favorite! Why? Because of what it represents and it is a beautiful knife in it's own right! The M-16 on the red handle and the etchings on the two blades plus the presentation case say it all! I could not have done a better job myself designing this knife! My only regret is that I didn't purchase this knife sooner!